Puzzle Pirates Forums - View Thread - Department of Diplomacy: Island Attractions! Forums » List all forums » Forum: Hear ye! Announcements » Thread: Department of Diplomacy: Island Attractions! In our most recent patch to the game, we added some new ways in which pirates, crews and flags can progress: Reputation! It is our hope that these standings further encourage you to take part in Puzzle Pirate activities that you already greatly enjoy, and we definitely plan to increase the number of areas of the game that affect your standing in the four Reputation categories. We do, however, have even greater plans for Reputation which I'd like to take the opportunity to reveal to you today. They will produce new and fun things for players of all types to do. They will give both flags that build them and players who use them appropriate Reputation points. They will easily change possession or be destroyed when a new flag takes over. This particular attraction is intended to dole out exciting expeditions to able-bodied and motivated pirates! 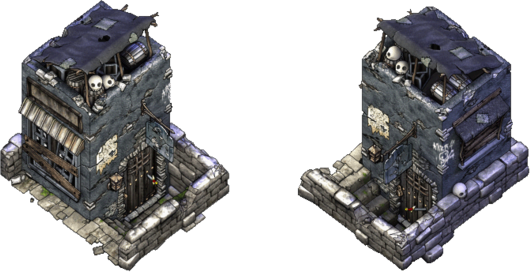 The governor will construct this building like any other, and then it will automatically sell items for a fee that allow players to take part in particular expeditions on their next pillage. Players who buy/use these items will also earn Explorer points for doing so, while the governing flag will earn Explorer and Patron points for providing them with the service. This building, however, does not have a name as of yet. Instead, we're turning to you for help! From now until 3PM PDT on Friday, October 9th, we're looking for suggestions for the name of this new building type. Have some good ideas? Tell us over here! The best suggestion will receive an incredibly awesome Hermes doll, and a number of runner up entries will snag developer eggs. I hope you've enjoyed this sneak peek into what's coming soon for Puzzle Pirates, and I look forward to talking with you about these exciting changes even more in the coming days! For now, any discussion and comments on this stuff should be directed to this thread on Game Design. The Piratical Geographic Society has completed its design for the Explorers' Hall, the perfect staging point for new piratey expeditions! Available from its well-appointed foyer will be a number of expedition charts that pirates can use to guide their vessel to one sort of adventure or another. These adventures will be unique to the Explorers' Hall: those pirates looking for buried treasure, sunken vessels or merchants to plunder will still need to extract that kind of information from defeated brigands. Governors are encouraged to begin preparations for constructing Explorers' Halls. While in the future several different types of Expeditions will begin at the Explorers' Hall, initially its resources will be used to organize raids upon the encroaching Imperial Outposts! The tyrannical Empire, no longer content to remain in the far off continental mainland, has decided to stamp out piracy once and for all in the archipelagos and bring them under the iron fist of Imperial authority! The Imperial Navy has recently been spotted constructing small forts and landing Troops of Marines on previously unclaimed atolls on the outskirts of the ocean, presumably to use as a base of operations for further incursions into pirate waters. The call is out, ye brave sea dogs! Pirates everywhere are encouraged to head to the Explorers' Hall to obtain the Expedition Charts needed to harry and plunder these accursed Imperial Outposts and ensure that free piracy will reign throughout the ocean! For discussion and plotting related to the Explorers' Hall and Imperial Outposts, please head to this thread on the Game Design forum. The second floor of the Explorers' Hall had emptied for the night, its denizens having already left for their estates, or for the poker tables. Only two figures remained on the sofa, dimly illuminated by candles. One of them, a large man with a turban that had somehow migrated from his head to his lap during the course of the evening, had his attention locked rather intently on what remained of a large glass of liquor. The other, a smaller man whose glass appeared to be filled with fruit juice, cleared his throat quietly. "So I take it that the Halls are a success, Commodore?" The larger man was unmoved. "You might say that." The smaller man stared at his fruit juice, swirling it idly. "Really giving those Imperials a run? Selling all sorts of intelligence?" The Commodore chuckled dryly. "Some. I didn't commission the Halls' design for the money, though, Marco." The smaller man laughed nervously. "No, no, of course not, Commodore." The Commodore shook his head. "No, money has little use for me here. Most of the things I desire are not easily acquired in these parts." He nodded his head meaningfully toward his snifter of liquor. "It's amazing, really, the effect location can have on value. This stuff..." The Commodore raised his glass and peered through it in disgust. "...on the mainland, it's no better than swill. But here? It's worth far more than its weight in Kraken's blood." He took a sip, cringing as he swallowed. Marco nodded politely and took a sip of his fruit juice. The Commodore paid him little notice. "It goes further than that, as well. The archipelagos are lousy with artifacts and trinkets of nominal value. There're more remnants of ancient civilizations and heathen cults here than you can shake a falchion at. But on the mainland? Those items have amazing value. Private collectors, museums, educational institutions... They'd all give their left arm for, say, just one Carcarias coin, or a sacred skull, or what have you." He turned to Marco and waved his finger. "You mark my words, lad. Someone's going to realize this eventually and make a fortune." Marco shifted awkwardly on his half of the sofa. "Erm, why not you, Commodore?" The Commodore was taken aback. He furrowed his brow and took a long, thoughtful draught of his liquor. It is my pleasure to inform ye of the imminent arrival in our oceans of traders from foreign climes! They will be housed in only the finest Trading Posts, the design of which was recently commissioned from some of the ocean's finest architects and artists, including the noble Master Greenbones himself! Eager to obtain artifacts for trade and sale back in their homelands, these traders are more than willing to share with you the products of their mastery of alchemistry and other skills! Flags that construct a Trading Post on their island will give pirates the opportunity to trade in previously earned Atlantis and Cursed Isle trinkets for Atlantean and Indigo chromas. This will also require a nominal fee. Keep your ears open in the coming days for more info on the final building design, its size and the commodities required for its construction! Note, however, that it will count as an Island Attraction for the purposes of building limits and that its rent will be along the lines of that of the Explorers' Hall; the wheels of commerce have to be greased somehow, after all! Additionally, we hope to come up with a related bonus benefit for a ruling flag who have constructed a Post of their own; more info on that coming soon! For discussion, plotting and any questions related to this and any future news regarding the Trading Post, please head to this thread on the Game Design forum! The ocean's finest architects have finished their design for the Trading Post! We hope both the archipelagos' residents and their new trading partners approve! The exchange rate between trinkets and prize items will be dynamically determined based on the number of trinkets that have recently been traded in. Each prize item, like the chromas, will have a base PoE cost attached to it that can be 'bartered' down by offering the Post trinkets of the appropriate type. Before you get too excited about purchasing these new prizes outright, please note that each reward will require a certain number of trinkets before the staff at the Trading Post are willing to let it go for PoE. The building will also have a second benefit. Any island that has a Trading Post built will appear more attractive to the ocean's Merchant brigands, making it more likely that they will grace that island's shores with goods for trade with its inhabitants. It can go on any medium or large island and will take up a 6x5 sized plot. As an Attraction, it is still subject to the island Attraction building cap. Large islands can have two Attractions built, but as medium islands can only have one, they will have to choose between building either an Explorers' Hall or a Trading Post. The base weekly rent for this building will be 20,000 PoE. The Post will also require the following commodities/labor for construction... 500 Wood, 2,000 Stone, 80 Iron, 300 Basic Labor, 200 Skilled Labor and 100 Expert Labor. Players having any additional questions or comments about the Trading Post are encouraged to join in the discussion on the Game Design forum, already in progress! Coming soon to a Trading Post near you: Designs! Designs are a new item type that function as an additional required component for ordering an item from a shop. Much like getting a portrait framed requires you to drag a portrait to the purchasing interface to place your order, certain special items will require that you possess a design of the appropriate type before you can order them. The design is used up in the process. The next update will bring the Trading Post several new recipes that can be used to produce designs for ordering Imperial Navy items from the Furnisher and Tailor. These designs will require trinkets that will begin dropping from the Imperial Outposts in short order. These trinkets will be earned very similarly to Brigand King trinkets. After successfully completing an outpost, a number of Imperial trinkets determined by the size of the outpost are equally divided amongst all 'experienced hands' aboard the ship (subscribers or players with a Pirate Badge or above). These trinkets can be collected like any other trinket, or traded in for the aforementioned reward items. In addition to all this, a few extra 'standard' recipes will be added to the Trading Post that will allow players to trade a variety of trinkets for furniture items that were previously only available as props in the Explorers' Hall! For discussion on this and other aspects of the Trading Post, head over to on the Game Design forum, already in progress. Marco stepped through the door of the Trading Post. As he approached the man sitting behind the counter, he nearly tripped on the pile of sand dollars overflowing from the trinket case. "I see business is still brisk, Commodore?" The man behind the counter looked up from his ledger. "Indeed. Our mainland customers can't get enough of these doodads and curios. Now if only that shipment of amulets I ordered would arrive." "The guy I bought them from gave me some fairy story about vampires. I didn't believe him, of course but it sounded like something folks around here might be interested in, especially after that unfortunate incident a few months back." "I'm sure they'll be here shortly. Although there do seem to be a lot of brigands around the island lately. You don't think they might have intercepted the shipment, do you?" The Commodore scowled briefly but looked up. "Nah, I know the captain. Mere brigands wouldn't stop him, Marco." Marco opened his coat and pulled a small package wrapped in black paper from inside. He placed it on the counter. "Sir, I just thought I'd get you a little something for letting me in on this little venture. I haven't seen this kind of profit since we used to hunt Krakens in Blackwater Bay." The Commodore pulled off the string and opened the box. He reached in and pulled out the small bat-winged pendant that lay inside. An orb in its center seemed to be filled with a thick, red liquid. "Where exactly did you get this, Marco?" Various organizations around the ocean have "acquired" certain mysterious items and are making them available to the piratical public. Through coordination with various local island governors, they're establishing the Black Market Island Attractions to offer their goods. In order to protect their customers from any possible pursuit by these items' original owners, they are offering these items pre-sealed in a Black Box. When opened, the lucky recipient will find inside one of several possible items. Black Boxes will be sold for 10,000 PoE. Rumor has it that several Brigand organizations have expressed interest in acquiring some of these Black Boxes, so expect increased brigand activity on the sea lanes near any island hosting a Black Market. Keep your ears open in the coming days for more info on the final building design, its size and the commodities required for its construction! Note, however, that it will count as an Island Attraction for the purposes of building limits and that its rent will be along the lines of that of the Trading Post. For discussion, plotting and any questions related to this and any future news regarding the Black Market, please head to this thread on the Game Design forum! In particular, if you have other types of items you'd be particularly interested in seeing available via the Black Market we'd love to hear about it. Be sure to knock three times before entering, and once you're in, don't mention my name. As mentioned previously, the Black Market will allow pirates to spend their hard-earned PoE on special prizes that come pre-sealed in a Black Box, pictured below. When opened, these boxes will contain one of a variety of special items, randomly selected. A partial list of these items can be found in the previous Department post, and a full list, including probabilities, will accompany the Attraction's production release. It's worth noting, however, that the "Black Market Trinkets" listed on the above prize list are trinket prizes unique to the Black Boxes, and our intention is that they will be able to be traded to the Trading Post for prizes. In addition to making Black Boxes available for public consumption, building a Black Market on an island will attract a seedier element to the surrounding waters, increasing the density of brigands and barbarians in nearby leagues. It can go on any medium or large island and will take up a 5x5 sized plot. As an Attraction, it is still subject to the island Attraction building cap. Large islands can have two Attractions built, and medium islands can only have one. With the addition of the Black Market, all islands will now have to make a choice as to what services they'd like to provide, as any single island will be unable to host all the available Attractions. The Market will also require the following commodities/labor for construction... 250 Wood, 4,000 Stone, 100 Iron, 300 Basic Labor, 200 Skilled Labor and 100 Expert Labor. Players having any additional questions or comments about the Black Market are encouraged to join in the discussion on the Game Design forum, already in progress! 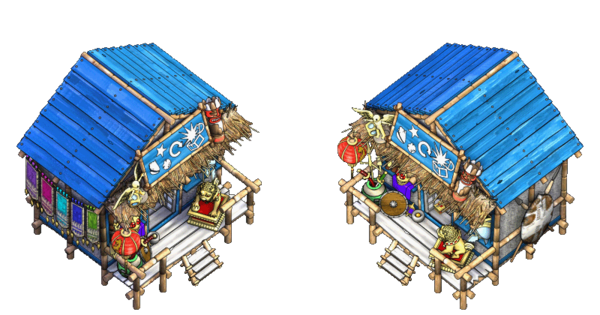 Our latest release has made some new Atlantean-themed rewards available in the Trading Post, and we'd really like everyone to have the opportunity to check them out. The Department of Diplomacy has therefore decided to permanently cut the base rent of the three different Island Attractions in half! From now on, the Black Market and Trading Post will have a base rent of 10,000 PoE/week, while the Explorers' Hall will have a base rent of 15,000 PoE/week. The Department of Diplomacy appreciates your continued civic involvement. We'll see you on the high seas!